Almost my entire world revolves around taking and creating images. It’s just what I do & I cannot imagine being without a camera, nor a world without images; they are my way of showing others how I view the world. Photography is a universal language. I have, through social media, photographic friends all over the world and through images, language becomes no barrier. I migrated to Perth, Western Australia from England with my family in the late 1960s, arriving on my 15th birthday and instantly fell in love with the place, which was such a stark contrast from growing up under the dull and seemingly ever-cloudy skies of Nottingham, I have never returned. I firmly believe that it is in part the Western Australian environment that has helped to shape my photographic career. Perth has a Mediterranean climate with the most amazing blue skies and as one of the most isolated cities in the world, it is often said to be Australia’s best kept secret. The people are friendly and the landscape is huge, as are the distances. Conditions are varied, with desert out to the east and north, red dirt country in the northwest, and wonderful Jarrah and Karri forests which contain an enormous range of unique wildflowers, in the southwest. In recent years I have focused my business on Commercial Photography, which is something I really enjoy. It is always interesting and gives me the opportunity to meet and get to know many interesting business professionals. On any given day I could be shooting anything from wines to sashimi, capturing the essence of a business or product, or creating executive portraits for some of the state’s business leaders. Over the years, my work has been used in a variety of publications, annual reports, posters, books, greeting cards, even several billboards at the Perth Zoo, and of course on many of my clients’ own websites & marketing material. New clients are always welcome to call. Cape to Cape, my first book, was published in late 2000 and is now out of print, (I am giving consideration to reproducing an updated version as an e-book). My second book, a commercial work celebrating the first 10 years of Ellenbrook where I live, was titled Ellenbrook: the New Town in the Swan Valley (released 2006). This book was produced by LWP Property Group, the developers, and it is also no longer in print. 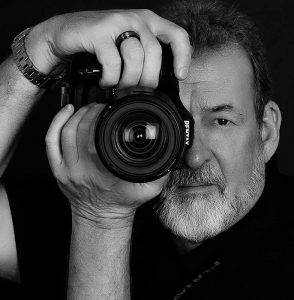 I began teaching photography in May 1986, after being approached by the University of WA’s extension services to give weekend photography classes. I developed a number of weekend courses and have taught thousands of novice photographers over the more than 31 years that I taught there. I found it a very rewarding experience, giving something back to photography, watching others become consumed with the same creative energy that drives me & helping them to master the craft. Unfortunately, with cut backs in the University they no longer have the space to offer such a broad curriculum of weekend courses & have pruned back courses drastically, including mine. 2012 saw my love of landscape photography bring me a fantastic commission with the City of Perth History Library to shoot the entire City over a five year period, creating an historical visual document of Perth City in the modern context, creating images which will be viewed for many generations. Whilst others may have recorded the day to day life of a city, my approach to this brief is to do something completely different, something that I haven’t seem done before. Rather than individual 35mm format photographs, I am creating panoramic views made up of many images, some even offering a 180 or even a 360 degree view of a location, capturing I feel the very essence of the city, the people going about their day, the transport & over time the changes as the city evolves. It is exciting to stand on a street corner & capture a moment in time on such a wide scale, and the detail captured by this method is far greater than a single shot & allows for much larger prints than a standard A4 size. In the last few years I have been honored with some fairly major achievements. Amongst other awards, I was named as WA Commercial Photographer of the year in both 2009 & 10 by the AAPP (The Australian Accredited Professional Photographers Assoc. ), and quite unexpectedly I also was awarded overall AAPP (WA) Professional Photographer of the Year in 2009. 2011 saw me awarded the coveted WA Landscape Photographer as well as WA Open Photographer in that same year. Those successes were overshadowed in 2012 when I was given my first national award by being named AAPP Australian Professional Photographer for 2012, AAPP Australian Landscape Photographer for 2012 as well as 4 other national and state awards. The culmination however was my being awarded a Master of Photographer by the AAPP, something I had worked towards for a number of years. I have always been an avid Pentaxian, using Pentax cameras exclusively, so I was very proud when in 2012 Pentax Australia awarded me the honor of being named a Pentax Master, one of only two Pentax photographers named as such in the whole country at that time. I was also named as a Pentax Brand Ambassador, something I do proudly. I can’t really remember not having a camera; photography has always been a part of my life. As a boy growing up in England I had a Kodak pocket Instamatic, and I still have some of those old black and white prints, although the negatives have long ago vanished into the ether. I became serious about photography in the 1970s, starting with a Miranda TM (basically a Pentax clone). I followed that with a succession of Pentax bodies (all of which I still have) and a complement of Pentax lenses, some of which I still use today. Before making the switch to digital a few years ago, I ran a Pentax LX and couple of Pentax MZ5n’s, which in my opinion is one of the finest film cameras that Pentax developed: the unique and very innovative feature of a switch to change the camera to a Panoramic mode changed the way I could capture the world on film. I moved into the digital age with the release of the 6 MP ist*d, upgrading through a progression of Pentax models, K10D, K20D, K5, K5IIs, and currently the K3 & the new 36 MP full frame K1, a camera with which I’m finding unlimited possibilities. I find the freedom of Digital photography & being able to view a result immediately is an amazing advantage, especially in commercial work where time is money. Although having the grounding in film photography taught me to get my exposures right, there are no 2nd chances with film. It’s hard to imagine that there are a whole generation of photographers who have never known a camera without the ability to see an immediate result. The industry calls it “chimping” & they could learn a lot from having to forego that facility for a few weeks. All of the images on this site were taken using Pentax equipment. As you can probably imagine, I have over the years amassed a sizable collection of images, mainly landscapes or nature photographs, many of which have rarely if ever been seen, other than perhaps on my Facebook page, and certainly not in print. I feel that it’s a shame to keep them locked in my archives. So I will be offering for sale a range of prints in a variety of sizes & finishes. Starting with some of my Panoramas in 1 metre, 1.5 metre & 2 metre sizes, for you to enjoy in your homes or offices. Each print will be produced by hand, specifically for your order and will not be off the shelf mass produced prints. Visitors to my new site should feel free to drop me a line and give me your feedback on the site, and of course my images. Thank you for taking the time to read a little about me. I hope that you enjoy my work.